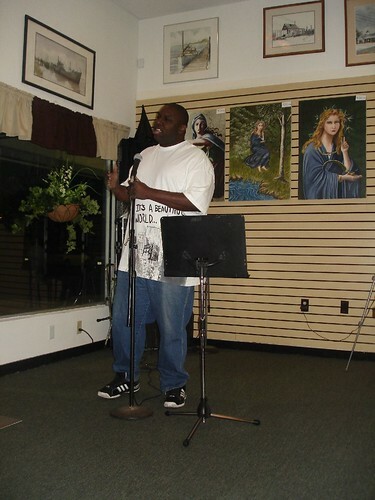 “Unrestricted” is the new open mic being hosted by Ray Tyler at Sherlock’s Books and Cafe in Galloway/Smithville. It’s on Tueday nights from 8-whenever it ends. We went on the very first night and got pictures of everything in action. As the name implies, this event is not for children. It’s not for children. The primary focus of the night was poetry, where “Unresctricted” was the focus. In-between acts, Ray would guide discussion with a primary focus on the unrestricted theme. Mostly relationship questions. 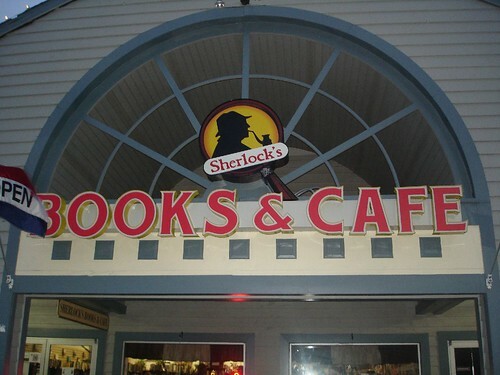 Ron and Susan O’Toole run Sherlock’s Books and Cafe, a really different book store. If you aren’t into poetry, and you’re in the Galloway/Smithville area, stop by to check it out. They have a great selection of books, good prices, and cheap coffee. They also have a large selection of different teas.If you want to check out the books with your kids, you might want to go a different night! But for those just dying to get what they need to say out of them, give “Unrestricted” a shot. You’ll be in good company. You’ll also be completely unrestricted. This entry was posted on May 27, 2009, 5:40 pm and is filed under Reviews of Open Mics. You can follow any responses to this entry through RSS 2.0. You can leave a response, or trackback from your own site.